The terrorists knew that I was the brainchild behind the Kenya Defence Forces’ state-of-the-art missile guided system. If the terrorists got hold of it the implications would be catastrophic. Anywhere could be targeted. Suicide bombers did not need to die anymore. The terrorists could as well demand Allah give them their seventy-two virgins on earth. Africa at large was under threat: Boko Haram had already established a caliphate in the West and Central Africa, they were now terrorizing the xenophobic South. Islamic State in Iraq and Syria (ISIS) had caliphated the North, and the ISIS-Shabaab alliance in Eastern Africa was fast gaining momentum. Terror. Violence. Death everywhere. Their main aim was not just to create caliphates all over the world. It was to make the whole world Islamic. A tic ran through my face. A moment later I heard the code: The Prince is delivering the eggs where the Queen wants them. I knew the rescue was on the way. I was among the very few High Value Persons (HVPs) in the KDF with a microchip in my brain. The chip was activated if I went off the radar for more than three hours to give my location. Special Forces would be send in for rescue regardless. A’shadieeyah steadied the gun in her frail-looking hands. She was dead serious she wouldn’t think twice to kill me. There was no vestige of the sister I knew in her eyes. I moved my hands behind my back. In my mind I was in a movie, trying to untie myself. The buzzing in my head increased. The stealth KV2050 attack helicopter was near, or perhaps it was hovering on the rooftop. And then it happened, in slow motion. I saw the first soldier rappelling in my peripheral vision an instant before three of them burst through the windows. They took the mujahedeen security guards first. That’s when A’shadieeyah knew what was happening. She swung her gun towards the intruders, squeezed the trigger, and then… click! She pulled the trigger again. Nothing. Her hands shook as she fumbled with the cocking handle and the safety catch of the gun. Then she gave up. 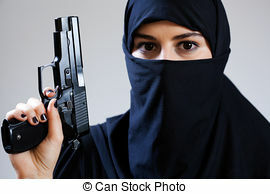 She threw the gun down and reached for a pistol hidden somewhere inside her burqa. She was fast. The soldiers never saw it coming. Headshots. Bull’s eye. The three soldiers went down successfully as she fired the shots. Three good men, mashujaa, killed by my mujahedeen sister. I was shocked of my sister’s mastery. Al-Shabaab-trained. Well trained. Plan B: I hopped backwards and smashed myself into the wall, shattering the chair and loosening the ropes. Before she reached where I was, I freed myself and stumbled up to my knees. She came closer to where I was. She ordered me with the gun to stand up, my hands raised and keep them where she could see them. And then she made a mistake—she blinked. Within a fraction of a nanosecond I grabbed the gun and pointed it at an astonished A’shadieeyah. Outside, an explosion plummeted down from the sky. My ride back home was gone, but that was the least of my worries at that moment. I heard cacophonous chants of Allahu Akbar! Allahu Akbar! outside and then made the decision. I put a single bullet in my sister’s forehead. The last thing I saw as she fell down was her shocked beautiful face and almond-shaped eyes zooming the world out, life snuffed out in an instant. My wow! Now this is vintage Vincent. One of the best fast paced flash fiction I've read in a while. The plot is so action packed and film-like that I had to read through without blinking a wink so I wouldn't miss any of the intrigues written in cinematic flashes. If you ask me I think you've found your niche and writing voice in Sci-Fi action thrillers. Stick to it! Like fine wine, you keep getting better at it with with each new piece. Well done Vin. Now, that's an endorsement, Nduka. I hope to never bore you. I will try to hold it together. Thanks for reading, and your coming back always.